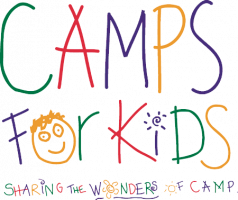 Camps For Kids is a Kansas City based non-profit organization dedicated to helping disadvantaged and special needs youth experience the wonders and the benefits of summer camp. Founded in 1980, Camps For Kids will provide critical funding for 20 summer camps in 2019. The camps in our network each have a specific focus, many related to children’s health. These include: chronic kidney disease, autism spectrum disorders, spina bifida, cancer, foster care children, bereavement therapy, burn victims, Crohn’s and colitis, diabetes, developmental challenges, and congenital heart disease. Camps For Kids works to assure that no Kansas City area youngster is denied the benefits of summer camp due to medical disability or financial disadvantage. Camps For Kids was founded by Marjorie Powell Allen and other community leaders, in 1981 after the federal government discontinued a program providing summer camp to children with disabilities or financial need at no cost to their families. In 2006 The Hallmark Corporation Foundation brought the Summer Dreams idea to Kansas City. Camps For Kids was selected as the lead agency for Kansas City’s Summer Dreams based on Camps For Kids 25 years of experience in assisting medically and financially disadvantaged campers. The Hall Family Foundation, H&R Block Foundation, Sosland Foundations, Sarli Foundation, The Menorah Heritage Foundation, The Oppenstein Brothers Foundation, and many others continue to be among the supporters of the Camps For Kids Campaign. It is still true today that it is difficult for many families with children who have physical or developmental issues or who are low-income to afford the cost of camp. Camps For Kids believes camp offers children who are financially, physically or developmentally disadvantaged opportunities to enjoy a sense of independence, enhance friendship skills, and participate in programs not otherwise available. The Camps For Kids camp network includes 20 camps which serve children from 5 to 18 years of age with disabilities including children with spina bifida, cancer, severe burns, diabetes, Crohn’s and colitis, autism spectrum disorders, developmental and/or physical challenges, chronic kidney disease, congenital heart disease, children in foster care, and/or children in financial need. Camps For Kids allocates funds after ensuring that our network continues to support the neediest of our community’s kids, with only the highest quality programming. We envision a community that recognizes the unique developmental benefits of the summer camp experience for our children, that organizes to provide sufficient resources, that “takes care of our own,” and that passes this salutary process on to subsequent generations.